The field of ambient intelligence is based upon a trend in engineering and design to create electronic systems that can sense their context and the behavioral cues of their users and adapt to them in order to guarantee a seamless and optimal user experience. Often, the paradigm that is used for designing the behavior of such systems is one that mimics the interaction between humans. Digital and electronic systems are often personified by means of ascribing human attributes to them, for example a personality trait or a behavior. Under the tendency to personify digital systems lies the assumption that such systems may, to a certain extent, function and communicate more efficiently with humans by acting like humans would. The aim of this study was to offer some insight in whether individuals react to the behaviors of ambient intelligence systems in the same way that they would react to those of other individuals. It also explored the pertinence of applying scales and analytical tools used for the psychological evaluation of human relations to the interaction between humans and computer systems. For this particular experiment, the system chosen to serve as the artificial actor to interplay with the human actor was a smart walk-in closet developed at the Eindhoven University of Technology. 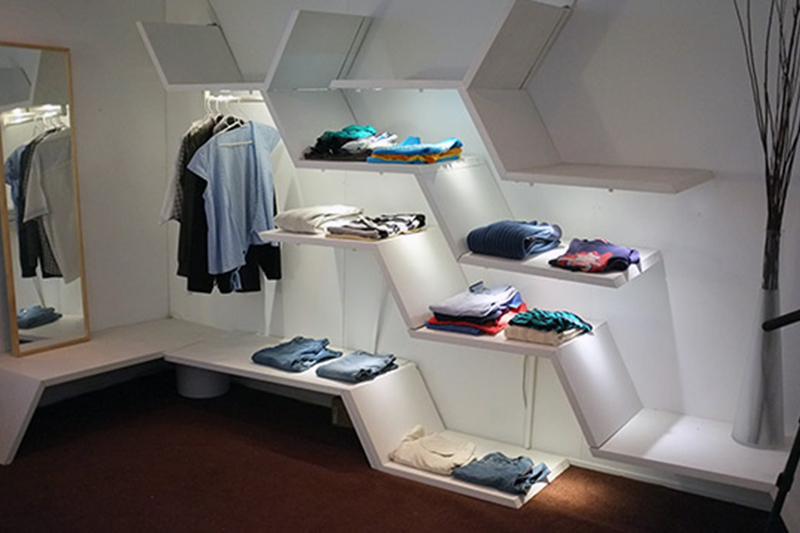 The closet is equipped with sensors and a lighting system capable of responding to a users’ movement by changing the way in which the light ‘behaves’. In order to design the lighting patterns (behaviors) of the intelligent closet and to predict the approach-avoidance behavior of a user in reaction to the ambient intelligence environment, the dominance-submissive axis of the interpersonal circumplex was used as a theoretical foundation. The interpersonal circumplex displays several variables measuring interpersonal relations as points in a circumference linked by an axis. Each axis links two diametrically opposed variables and variables situated opposite from each other are negatively related . This theory states that the behavior of a person tends to induce a complementary behavior from their counterpart. More concretely in this case, that a dominant behavior elicits submissive responses and vice versa. Taking into account nonverbal cues from behavioral sciences theories, we designed 3 dominant, 3 submissive and 3 neutral lighting behaviors and chose the one regarded as most effective by participants during preliminary testing in each category. We then did further testing with 20 participants. First we asked them to complete a questionnaire that would place them as predominantly submissive or predominantly dominant. We then asked the participants to perform a set of tasks in the walk in closet. In each case the closet showed randomly one of the 3 types of behavior. Our initial hypothesis echoed current trends in presuming that there would not be any difference in the way that an individual reacted to an intelligent system exerting an obviously dominant or submissive behavior and how this individual was expected to react to another individual exerting the same kind of behavior. The results of our experiment indicated otherwise: there is evidence that suggests that users behave differently when interacting with computers and when interacting with people.